Upon our arrival, we embark on an amazing tour at one of Philadelphia's premier museums, the National Constitution Center, the only museum dedicated to the U.S. Constitution. Must-see exhibitions, live performances, rare artifacts, and hands-on activities that bring the Constitution to life will inspire you! Today we travel to Philadelphia, Pennsylvania, officially nicknamed the City of Brotherly Love in 2014 for a Flavors of Philadelphia tour and a delicious lunch. Upon our arrival, we embark on an amazing tour at one of Philadelphias premier museums, the National Constitution Center, the only museum dedicated to the U.S. Constitution. Must-see exhibitions, live performances, rare artifacts, and hands-on activities that bring the Constitution to life will inspire you! 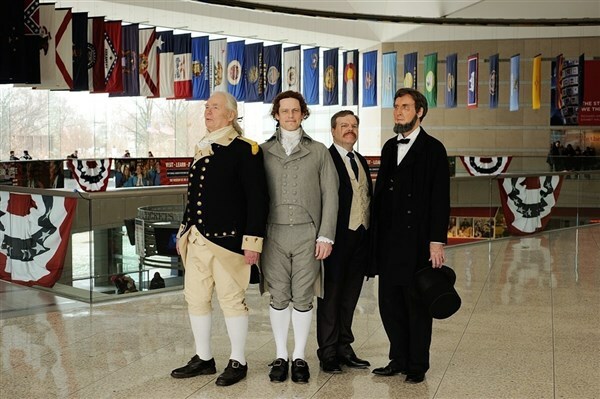 The U.S. Constitution is brought to life by immersing you in hundreds of interactive exhibits, engaging theatrical performances, and with displays of original documents of freedom. View Freedom Rising, the 17-minute multimedia theatrical performance; The Story of We the People, the Centers dynamic, interactive main exhibit; and Signers Hall where you can sign the U.S. Constitution alongside 42 life-size bronze statues of the Founding Fathers. Next, we visit one of Little Italys most beloved cafés, Gran Caffé LAquila for a delicious lunch where you will enjoy exceptional Italian cuisine. We conclude our day in the City of Brotherly Love 57 floors above street level at one of Phillys newest and tallest attractions, One Liberty Observation Deck. We will ascend to the top of Phillys enclosed observation deck for amazing 360-degree birds-eye views of the city and beyond. From the Observatory, look out on the expansive horizon and feel the citys invincible spirit while you take in the iconic sights, surrounding waters and panoramic views of the skyline including; City Hall, the Delaware and Schuylkill Rivers, Fairmount Park, Love Park, the Ben Franklin Parkway, and Phillys top points of interest. An interactive environment teaches you about your view from every direction, providing a comprehensive multi-lingual educational experience. From 883 feet above street level Philly can only be described as Viewtiful! 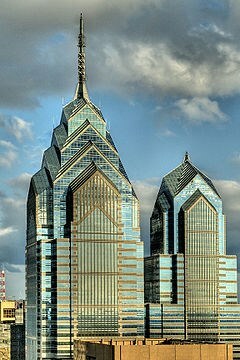 Today we travel to Philadelphia, Pennsylvania, officially nicknamed the "City of Brotherly Love" in 2014 for a Flavors of Philadelphia tour and a delicious lunch. 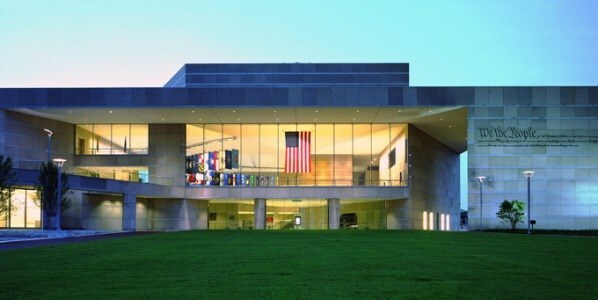 Upon our arrival, we embark on an amazing tour at one of Philadelphia's premier museums, the National Constitution Center, the only museum dedicated to the U.S. Constitution. Must-see exhibitions, live performances, rare artifacts, and hands-on activities that bring the Constitution to life will inspire you! 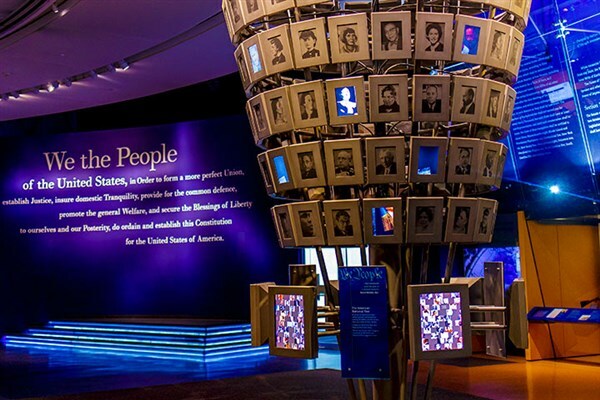 The U.S. Constitution is brought to life by immersing you in hundreds of interactive exhibits, engaging theatrical performances, and with displays of original documents of freedom. View Freedom Rising, the 17-minute multimedia theatrical performance; The Story of We the People, the Center's dynamic, interactive main exhibit; and Signers' Hall where you can sign the U.S. Constitution alongside 42 life-size bronze statues of the Founding Fathers. Next, we visit one of Little Italy's most beloved cafés, Gran Caffé L'Aquila for a delicious lunch where you will enjoy exceptional Italian cuisine. We conclude our day in the "City of Brotherly Love" 57 floors above street level at one of Philly's newest and tallest attractions, One Liberty Observation Deck. We will ascend to the top of Philly's enclosed observation deck for amazing 360-degree bird's-eye views of the city and beyond. From the Observatory, look out on the expansive horizon and feel the city's invincible spirit while you take in the iconic sights, surrounding waters and panoramic views of the skyline including; City Hall, the Delaware and Schuylkill Rivers, Fairmount Park, Love Park, the Ben Franklin Parkway, and Philly's top points of interest. An interactive environment teaches you about your view from every direction, providing a comprehensive multi-lingual educational experience. From 883 feet above street level Philly can only be described as "Viewtiful"!